Following a sold out acoustic tour last year, Grammy nominee, Brandy Clark has returned to the UK and due to such high demands, she even added an extra date to her London shows. Clark’s latest album ‘Big Day in a Small Town’ has brought the singer great success, not to mention the many songs that she has written for other stars such as Miranda Lambert and Kacey Musgraves. After completing the ‘Highway Vagabond’ tour with Miss Lambert, it was our turn to see singer songwriter in action! Union Chapel is the not the most conventional concert venue as you’ll find yourself sat on church pews, with a soft drink in hand. Due to it being a chapel, no alcohol is allowed inside, which won’t be an issue for many but if you fancy a drink, you’ll need to go to the bar and stay in there, which due to the unreserved seating can cause you to lose out on a seat, however if this isn’t a problem for you, overall the venue is great, the acoustics are amazing for the music and the place looks beautiful. Country duo Cross-Atlantic opened the show with a few of their songs, including their hit single ‘Mercy’. We got a taste of their storytelling lyrics and perfect harmonies as they warmed up the crowd for Brandy Clark. They ended their set with a version of ‘Go Your Own Way’ by Fleetwood Mac which has the crowd moving and singing along. After a short break and trip to the bar, it was time to get seated for Brandy. 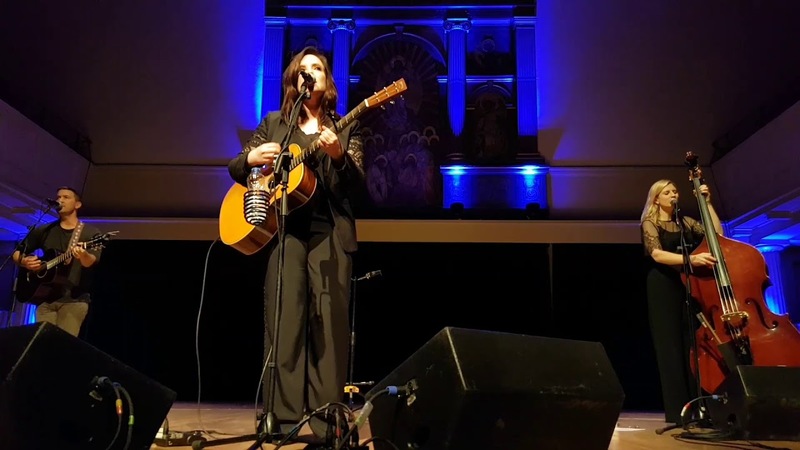 I couldn’t think of a better venue to see an artist like Brandy Clark perform, the intimate setting and subtle lighting provided the perfect venue to listen to a voice like Brandy Clarks, this was made apparent when she instantly began singing ‘Hold My Hand’. It didn’t take long to silence the audience as we all became mesmerised by her faultless vocals that filled the room. Brandy followed with her hit single ‘Love Can Go to Hell’, which she started off slow, giving a haunting performance as the acoustics of the room helped add to the effect, however it wasn’t long before she kicked it up a notch to provide a faster and well know version of the song. After singing her first few songs, Brandy addressed the crowd and explained how happy she was to be performing in a venue like Union Chapel, she went on to explain to the fans that tonight she hopes we will go on a ‘Rollercoaster of emotions that involves crying, laughing and then crying until you laugh’, this received a warm applause and even more excitement from the crowd. Miss Clark continued by singing ‘The Day She Got Divorced’, after explaining that she was getting all the slow and sad songs out of the way, ready to get everyone a little rowdier. It is clear from hearing this song that there are a few Kacey Musgraves vibes, especially if you hear the song ‘This Town’, which was co-written with Brandy herself, musically there are some similarities which is nice to hear and shows that Brandy Clark’s style and writing is very influential and great to hear from other artist too. Brandy then sang her hit single ‘Girl Next Door’, the opening notes provoked a loud cheer from the audience as everyone was excited to hear a song they love and that obviously resonates with many of them. Brandy then followed with a story that came from the line ‘Sorry I ain’t sorry, that I ain’t your Marsha Brady’ whereby Maureen McCormick, the lady who played Marsha Brady’s character messaged the singer about the song, which prompted a new friendship. Brandy Clark was pretty excited by this and explained that if she had never written the song, she wouldn’t have such a friend. The following segment of songs were what Brandy referred to as ‘An ode to drinking’, she joked that she always had wanted to create an album dedicated to all the bad things, such as drinking, smoking & cheating, she just hadn’t found a label that would allow that. After singing her songs ‘Get High’, ‘Drinkin’ Smokin’, Cheatin’, ‘When I Get To drinkin’ ‘You’re Drunk’ and ‘Hungover’. Judging by Clark’s catalogue, that drinking album would be too difficult to make! When Brandy began singing her song ‘Three Kids No Husband’, again the crowd gave a big cheer, indicating that this is a fan favourite. The honesty and real-life struggles that are written in these lyrics made this performance so relatable, which was clear from the crowd’s response. Brandy then asked if anyone was from a small town, which was met with many cheers. After being respectfully quiet for most of the evening to listen to the music, the audience really responded to ‘Big Day in A Small Town’ by cheering and singing along. Brandy then introduced the start of her “revenge section” by playing Daughter. Which is a very witty song about wanting the man who did her wrong to have a daughter so he can experience through his daughter what it is like when a girl’s heart gets broken. This song was followed by hit song ‘Stripes’ which the audience once again clapped along to. When talking to the audience, you really got a sense of how grateful Brandy was that we attended her show. The fact that she added an extra show really proves how popular she is the UK. Brandy displayed her gratitude by playing us a brand-new song. It was a mellow song in the now familiar Brandy sound. The show was brought to a rousing finish with ‘Pray to Jesus’ which the audience joined in with. After lots and lots of encouragement Brandy returned for her encore. After taking time to thank the crowd for their continuing support she played ‘You Can Come Over’. Whilst the venue was large the sound was intimate and that made for a fantastic show which was appreciated by fan and artist alike. Brandy put on a fantastic show and there is no doubt she will be back in the UK soon. Chris Young – Losing Sleep: We take a look at the seventh studio album from the singer. Copyright © Six Shooter Country. All rights reserved.